Canadians pour over the border every year for the Toronto Blue Jays’ annual visit to Seattle, and this weekend’s series against the Mariners was no exception. Blue Jays fans, mostly from from Western Canada, turned out in full force to give their team home field advantage more than 3,000 kilometres away from Toronto. Three wins in four games, coupled with beautiful weather, and the August long weekend ensured that a good time was had by all the Canadian invaders. Unfortunately, one fan had too good a time. Late in Saturday’s game, a visiting fan from Canada jumped onto the field, leaving his clothes behind. While stadiums can’t let fans onto the field for obvious reasons, the streaker was a crowd favourite – receiving an enormous roar during his run of freedom. 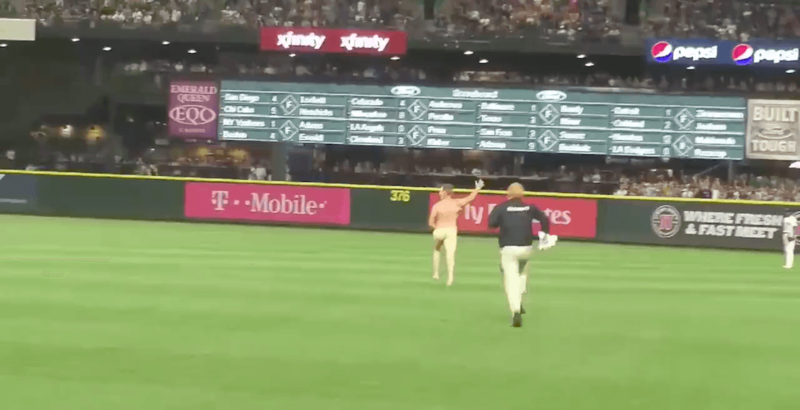 After racing into the outfield, the fan was tackled by Safeco Field security and ushered off the field – with a towel covering his, uh, bat and balls. The streaker is an Irish resident of Vancouver, but not a Canadian citizen, according to Sportsnet’s Shi Davidi. Jumping onto the field to win an $80 bet with his friends, he was still in a Seattle jail the next day. According to a report from Sportsnet’s Hazel Mae, the fan could be even be deported back to his home country of Ireland. This is another example of how horribly wrong trespassing during a sporting event can go. Seven weeks earlier in Vancouver, a pantsless BC Lions fan allegedly suffered a brain injury after he was flattened by a player after he ran onto the field during a CFL game. At last check, the fan was pursuing legal action.